There was no stopping the 'Indo-Pak Express' as Rohan Bopanna and Aisam-ul-Haq Qureshi inched closer to their maiden Grand Slam title together by advancing to the US Open finals. Continuing with their message of 'Stop War, Start Tennis', 16th seeds Bopanna and Qureshi beat Argentines Eduardo Schwank and Horacio Zeballos 7-6 (5), 6-4 to set up a summit clash with top-seeded American brothers Bob and Mike Bryan in the finals. "I mean, to win a Grand Slam you have to beat the best there is. 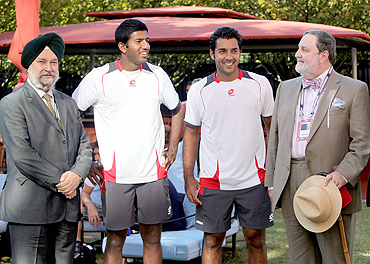 That's what Aisam and me keep telling (each other)," Bopanna said after the win on Wednesday night. The Indo-Pak duo was cheered on from the stands by, among others, the United Nations ambassadors from their respective countries. India's ambassador Harpreet Suri and his Pakistan counterpart Abdullah H Haroon even met the two players after the match. "I can't thank Rohan enough for being my partner and playing with me. I really feel very lucky to have a partner like him and a friend like him. Pakistan has been going through a lot for the last two or three years from all the terrorist attacks and the flooding now for the last few months and the cricket scandal, also," Qureshi said. "I think what changed both our careers was when we became ambassadors of peace, by peace in sports. 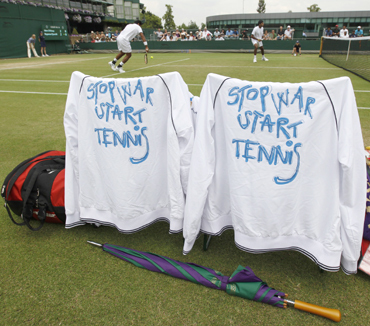 The first time we initiated our campaign about Stop War and Start Tennis, I think that was the main week I think everybody started to taking notice of it," he added. Though their summit clash seems tough on paper against the Americans but Bopanna and Qureshi can draw confidence from the fact that they beat the Bryans just a few weeks ago in an ATP tournament in Washington. "They are the best out there now. For us, we just have to go there, play our games. You know, we just beat them few weeks ago in Washington, so, you know, we are really looking forward to that Friday match, and we go in confident, playing and doing well there," Bopanna said. Qureshi said his pairing with Bopanna has worked perfectly so far because he shares a warm relationship with the Indian off-court as well. "I always believed if we played consistently on ATP, me and Rohan both as a team, we can do really well on the tour and we can make our mark," he said. "And in the last past two or three months we have had I think wins against all the top 10 teams in the world. It just shows that I was pretty right about our pairing together, and you know, it would be just a matter of time. I always believe we can do really well in the Grand Slam on the ATP circuit. "Making quarterfinals at Wimbledon was a huge learning experience. I definitely learned a lot from it, and that whole experience is definitely paying off in this US Open these last two weeks," he added.